A Moate farmer has expressed pride at the legacy of his late father’s generosity after travelling 6,500 miles to be reunited with a cow donated by him to a destitute African family a decade ago. 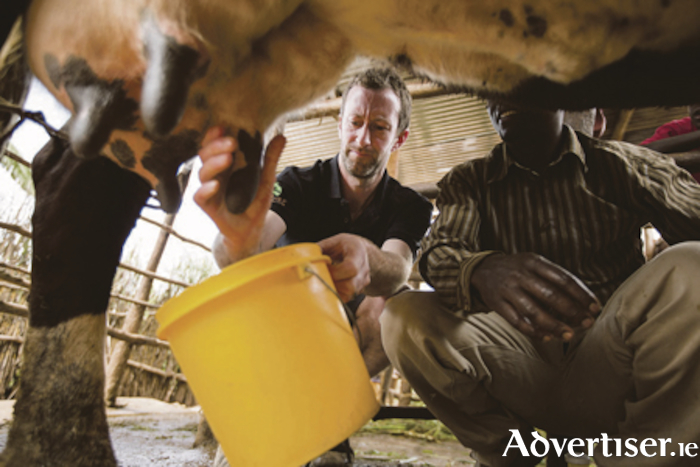 Colm Doyle travelled to the heart of Rwanda in Africa to see first-hand how a cow donated by his late father Jimmy 11 years ago had transformed the lives of a Rwandan family. The cow is just one of an impressive and ever growing herd of cows sent since the mid-noughties by a local group in Moate through aid agency Bóthar to impoverished families in Rwanda, other parts of Africa, and Eastern Europe. The cows have had a transformational effect on the lives of an estimated 1,000 plus families as the aid agency returns each year to re-impregnate the cows, with a deal struck with each recipient family that they must pass on the first born female calf to a neighbour. Prior to being given a heifer, each family undergoes a six month programme of training in animal husbandry, water-harvesting and basic horticulture practices. The Moate Bóthar group started off 15 years ago by raising funds through the local national school to send out just one goat. A decade and a half later, they are sending on average 50 cows and up to 80 goats each year. In one year alone, they sent out 115 in-calf heifers. And, having returned from Rwanda recently, Colm Doyle said his late father would have been proud. Colm was also reassured by the condition the cow is in after ten years in Rwanda.